When my brother and I were young, our parents would build us igloo forts out of blue sheets in the living room before putting us to bed. They would turn off all the lights except for a string of white Christmas lights that looped through our plants, and turn on the jazz-fusion, African-rhythm synthpop of Afro-Parisian Wally Badarou, creating an icy new world for us. What I now recognize as a way to calm two small children before bedtime felt like magic to me then. Our living room was transformed into a timeless space that felt simultaneously prehistoric and futuristic. Grace Jones’s “Slave to the Rhythm” was in heavy rotation in our household. I remember poring over the cover art—her fierce eyes; her avant-garde high-top fade; her open, extended mouth like a chomping cyborg or an insect mandible; and her glossy brown skin. All this, paired with her booming and distorted voice over African percussion and synth, made her a mesmerizing figure to my 7-year-old ears and eyes. I had never heard music or a voice like hers, and although I didn’t completely understand her or the world she was creating with her music, she would go on to influence my ideas of womanhood, blackness, and the performative nature of identity. In a way, these were my first introductions to Afrofuturist music. While the term “Afrofuturism” originated with cultural critic Mark Dery in 1993, the idea behind it has existed for far longer, and the genre has expanded into all mediums as both an aesthetic and an expression of critical race theory. Afrofuturism is a way to project blackness into the future—not merely as existing, but as a critical and significant part of it. In music, Afrofuturists play jazz, funk, soul, electro, rock, dub reggae, and hip hop—or more often than not, a blurred and blended form of all of the above, with artists from Miles Davis to Earth, Wind & Fire to Erykah Badu engaging with the aesthetic. But this is beginning to change with the emergence of artists like Janelle Monáe, THEESatisfaction, Ebony Bones, Solange, Kelela, Moko, and other musicians who are overt about the influence that Afrofuturism has on their work. While ’90s and early-2000s artists like Missy Elliott, TLC, and Janet Jackson explored its aesthetic, there is no denying that Afrofuturism is permeating culture in a more deliberate way today. Now, musicians (many of whom happen to be roughly the same age as I am) honor, experiment with, and often subvert the sounds, tropes, and images of the Afrofuturism we grew up with. As a result of the wider acknowledgment of Afro-futurist art, more voices have emerged in pop culture to expand notions of blackness into the future as well as to transform ideas of blackness today. I’mma keep leading like a young Harriet Tubman/ You can take my wings but I’m still goin’ fly/ And even when you edit me the booty don’t lie/ Yeah keep singing, I’mma keep writing songs/ I’m tired of Marvin asking me, “What’s Going On?”/ March to the streets ’cause I’m willing and I’m able/ Categorize me, I defy every label/ And while you’re selling dope, we’re gonna keep selling hope/ We risin’ up now, you gotta deal you gotta cope/ Will you be electric sheep? Electric ladies, will you sleep?/ Or will you preach? Visions of the future are largely concerned with science and technology, and Afrofuturism acknowledges the rocky relationship African Americans have historically had with these fields: In science’s shady past, the African-American body was treated violently, with black female bodies treated as especially alien or other. In Afrofuturism, adopting an alien, cyborg, or robot alter ego is one way to reclaim this previously negative relationship with science and technology. It is no surprise, then, that themes of body, image, and alter ego factor into the work of women Afrofuturist musicians so strongly. Whether through makeup, hair styles, costuming, or special effects, the cyborg or robot alter ego can act as armor to protect against the pop-music industry’s limiting expectations. “It’s a way to step outside the race box and escape expectations about what kind of music a black person should create if they want to be successful,” says Ytasha L. Womack, author of 2013’s Afrofuturism: The World of Black Sci-Fi and Fantasy Culture (read our interview with Womack here). “Creating an alter ego empowers an artist to go beyond social conventions. It’s a way of redefining yourself before the world. When an artist creates a new origin, a new story and declares that they are from space, that artist is compelled to create new, boundary-crossing music.” Missy Elliott’s ballooning black vinyl suit cements her as the queen bee of her surrealist world in the music video for “The Rain (Supa Dupa Fly).” Nicki Minaj reclaims her weirdness as the pink Day-Glo “robo diva.” These personae signal that the artist will not be hemmed into preconceived notions of what they can be—either as an artist or a black woman. Alter egos also offer ways to make politicized statements through personal expression. Monáe has created the cyborg identity Cindi Mayweather, who, whether clad in white, vinyl robo-gear or transformed into a pompadoured, gender-bending incarnation, fights for freedom of expression against oppressive powers. In Monáe’s video for “Tightrope” (which contains visual nods to Sun Ra’s 1974 film Space Is the Place), Cindi Mayweather breaks out of an institution where music and dancing have been banned. It is significant that this Emma Goldmanesque dance revolution is led by the black and brown residents of the institution, played by Monáe and her band of collaborators. 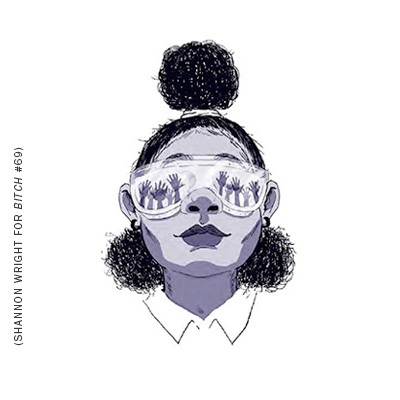 Some critics, like Jody Rosen at New York magazine, have complained about a disconnect between Monáe’s image and her music, but it’s clear that she is simply doing something new that doesn’t quite fit with the stereotype with which critics are attempting to pigeonhole her. In his September 2013 Flavorwire article, “Let Janelle Monáe Be Janelle Monáe,” Tom Hawkings worries that “Afrofuturism” is too limiting a term for artists like Monáe. But artists who identify as Afrofuturists know that it doesn’t nullify all other identities. In fact, the cyborg, alien, or robot identity is integrated into the multifaceted black and female identity, and can be dropped at any time. London’s Ebony Bones doesn’t take on any alien persona or robot identity, but rather pairs her otherworldly look with sci-fi references, political messages, and genre-jumping, danceable music. Part I of her album Behold, A Pale Horse, titled “Born in Flames,” is a reference to Lizzie Borden’s 1983 feminist sci-fi film of the same name that depicts an alternate universe in which the United States is a socialist democracy. The film looks at racism, sexism, classism, and heteronormativity. Additionally, Bones’s “Born in Flames” is also about the riots and economic turmoil she experienced growing up in London’s Afro-Caribbean community during the Thatcher administration. Word goes on to note that although “Afrofuturist feminists [may] shape-shift, hybridization, including robotics, may occur—it’s not a permanent state that negates the black female body” entirely. So, Seattle duo THEESatisfaction can explore Afrofuturism through the song “Earthseed,” based on the sci-fi series of the same name by Octavia E. Butler, in which she details a fictional religion based on the concept “God is Change”—and then on the same album, produce a jam like “QueenS,” which is all about getting down in the here and now. In the music video, you’ll see the most fashionable house party you can imagine—all bright colors and prints, dangly earrings, ’fros and braids—and a celebration of queer female friendship. Yet artist Martine Syms reminds us not to get too far-out with ideas of the future when there is still so much change that desperately needs to happen now. In December 2013, Syms published “The Mundane Afrofuturist Manifesto” online at Rhizome. It was inspired by a manifesto from the 2004 Clarion West Writers’ Workshop in which sci-fi and fantasy writers called for a new science fiction rooted in the future of humanity on Earth, rather than on spaceships or alien worlds. In the manifesto, Syms states “While we are often Othered, we are not aliens. Though our ancestors were mutilated, we are not mutants.” She calls for the production of Mundane Afrofuturist literature that contains no interstellar travel (too time-consuming and expensive); no “inexplicable end to racism;” no aliens, alternate universes, or revisionist history; and no tropes of mammies, jezebels, or sapphires. Syms wants artists to create Afrofuturist work that doesn’t skip over or sanitize the messy, brutal, complicated nature of structural racism and sexism with unlikely scientism. In early 2014, Syms will release a Mundane Afrofuturist album called Most Days, which will feature a table read of a screenplay written by Syms about “what an average day looks like for a young black woman in 2050 Los Angeles” as well as a score composed with artist Neal Reinalda. While the parameters of Mundane Afrofuturism are no doubt too restrictive for many musicians and artists, it is the differences in approach and the continued evolution of the genre into deeper, more nuanced territory that is part of the power of Afrofuturism. When I was a child, Afrofuturist music and musicians helped me project a vision of myself, my weirdness, and my hybrid identity as a biracial woman into blackness and into the future. Now that I am an adult, Afrofuturist musicians make me hopeful for the future, because they are pushing and working for change. Alley Pezanoski-Browne is a documentary producer, music writer, and a master’s candidate in critical theory and creative research at the Pacific Northwest College of Art. She would like to thank Ytasha L. Womack, Tanekeya Word, Alondra Nelson, Michael A. Gonzalez, Jakeya Caruthers, Paul D. Miller, Julian Gill-Peterson, Amir George, Tony Browne, Iris Williamson, and Nick Barbery for their assistance with this piece. Editor’s Note: It came to my attention after production that “Black to the Future,” the title our editorial team thought up for Alley’s article, is the very same title as Mark Dery’s 1993 seminal Afrofuturism article, referenced in this piece. I regret not noticing this earlier. —Kjerstin Johnson, editor in chief. Alley Pezanoski-Browne is a writer and media producer currently based in Portland, Oregon. She has also lived in and loved Milwaukee, Chicago, San Francisco, and Hong Kong. She is a big fan of good books, music, food, and living room dance parties. Why not just say <i>the bodies of African-Americans</i> and <i>the bodies of black women</i>? Just wondering which show at the Studio Museum was curated by Alondra Nelson? Also wondering why metaphor and the poetics of images appear to truly confuse young artists and writers. The concept of ALIEN is in play right now today in regards to actually humans. Past present future compressed with the cosmic gravity of our own shared histories, futures ans right-nows. Yes! The idea of queer ness in Afro-furtism can be expanded to the max. Not enough can be said about our origins in that regard. Maybe google cosmos? It ease the essentialism that contracts some ideas in this very interesting article. Thanks for writing! The show was called The Shadows Took Shape, and Nelson was one of the co-curators. Alondra Nelson didn't curate The Shadows Took Shape at the Studio Museum. The exhibition was co-curated by Naima Keith and Zoe Whitley. My mistake! Thanks for the correction. The concept of hopeful queer futurism is always interesting and important. It gives us the possibility of imagining a world where racism, sexism and all their ugly brothers and sisters do not exist. But it's true that a lot of times it functions as an escapist poetics, so I'm very excited about Syms' new album! This is especially important with all the idiotic comments that pop up about the internet and anonymity (ie. making people non-gendered and non-racial) being a helpful way to end racism. Imagining that everybody is a white dude does not help anyone in real life. How can we imagine a cyborg/android/tech world where we celebrate difference? I'm excited to be part of this dialogue, but I want to clarify that my position isn't intended to curtail creativity, or "not get too far out." It's quite the opposite. I believe that minimalism, conceptual art, and abstraction can be aesthetic resources for politicized work. I'm less interested in maximalism and it's attendant ideology, though I appreciate the baroque quality of many popular black artists. I'm more interested in Blackness as an abstraction, and bringing that into a larger art historical conversation about modernism. Thank you so much for clarifying and for giving more depth into your thoughts on Mundane Afrofuturism. I'm excited by the idea of more minimalist, politicized works of Afrofuturism. Alexis Shotwell’s recent book, Against Purity: Living Ethically in Compromised Times, urges us to think productively about engaging not with our ideal world but with the one we actually live in with real implications for conversations about free speech, safe spaces, coalition organizing across racial lines, and confronting an irreversibly altered planet.